It is no secret to anyone that knows me well that I like change. As soon as you get used to something, I want to change it up. But, I value stability too. I actually think that you can be a really stable person who embraces change. I try to be one of those people. I will let you debate whether I am succeeding. Smile. 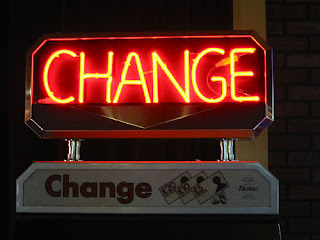 I read this on the Swerve Blog today: "Change is good, all the time, and all the time, change is good!" You may or may not agree with this, but is one of Lifechurch's core values. Whether you are a fan of change or not, there is one thing we know. You nor I can stop it. We can always count on it happening. I keep tabs/memos/notes over the years. While swapping some memos out of my old phone and into a new one I just got, I ran across this thing I jotted down several years ago and thought I would share it. It shows you how fast change can happen. Things JUST 50 years old (my parents were kids/teenagers), are now so foreign that they are officially hilarious. "I'll tell you one thing, if things keep going the way they are, it's going to be impossible to buy a weeks' groceries for $20.00." "I'm afraid to send my kids to the movies anymore. Ever since they let Clark Gable get by with saying "damn" in "Gone With The Wind." It seems every movie has a "hell" or a "damn" in it." "Did you see where some baseball player just signed a contract for $75,000 a year just to play ball? It wouldn't surprise me if some day they'll be making more than the President." "No one can afford to be sick anymore, $35.00 a day in the hospital is too rich for my blood." My how things have changed. And fast. What we see today will look equally (or more) silly than this stuff in 2050. Can you imagine?